Traveling around Berlin in Brandenburg – this is also a wine region, yes! 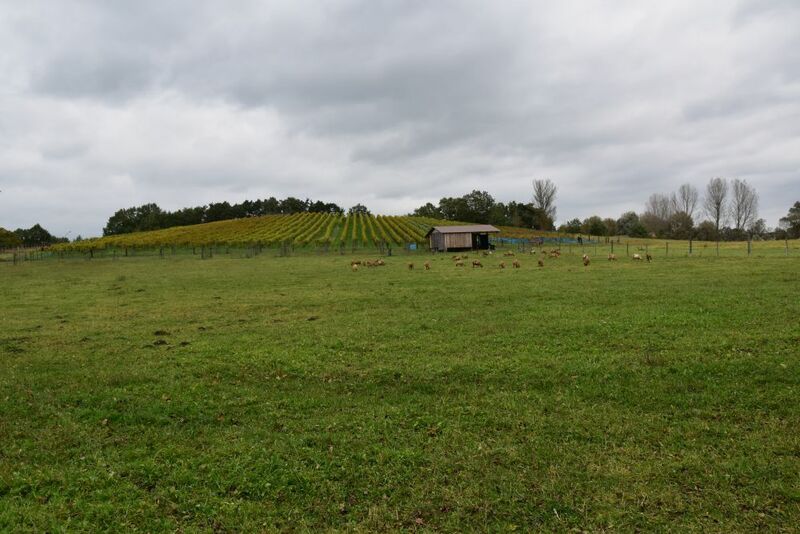 Brandenburg – wine region – are you serious? Yes I am. Brandenburg is surrounding Berlin, and is located pretty far north in Germany. Too far north for wine, I always thought. But then I came across the book “Weinland Brandenburg” by Tom Wolf (be.bra Verlag Berlin 2016). 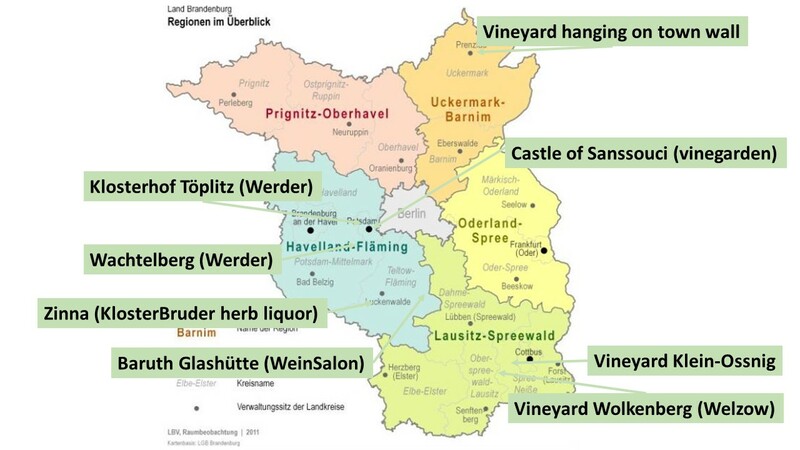 Tom Wolf describes 31 vineyards in Brandenburg. Very interesting. I decided to explore some of them, when traveling in Brandenburg, the hinterland of my mother town Berlin. 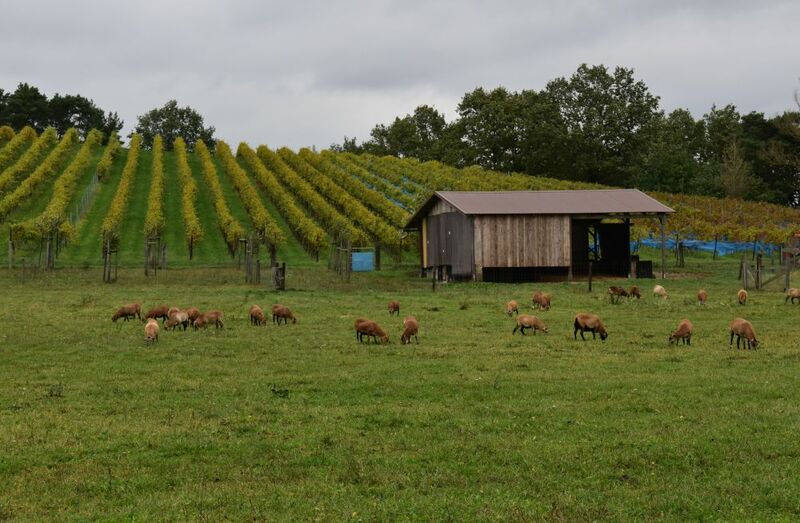 Why are there wines in Brandenburg – so far north? In early medieval times, Europe was christianized. 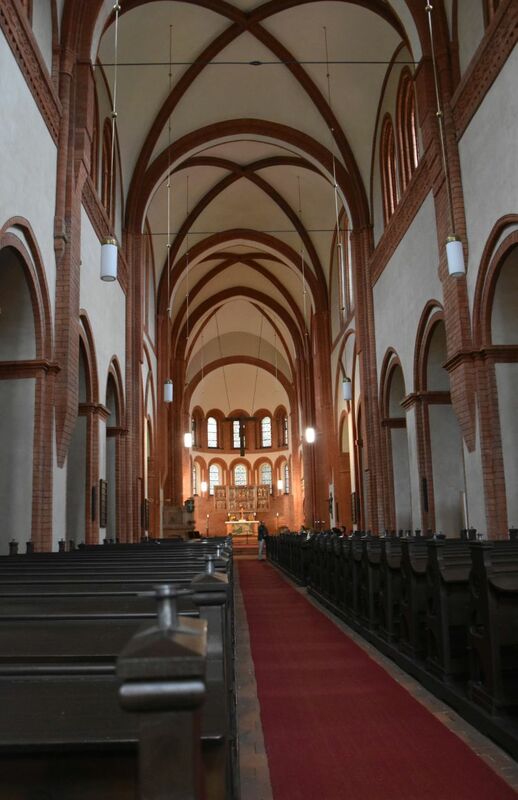 As a consequence, monasteries were founded – also in Brandenburg. The monasteries needed wine for their cult and hence started to grow grapes for that, but perhaps the monks also enjoyed some of their wine from time to time. It was Frederick the Great who stopped the wine production in Brandenburg in the early 18th century. He was of the opinion that potatoes are more useful – and he made his people cultivate potatoes instead of wine. In addition there were more frequent frosts at that time that discouraged cultivating wine. Shortly before the iron curtain fell and even more after the reunification of Germany, the tradition of cultivating wine took off again on some of the sunny hills that the monks had already selected earlier. 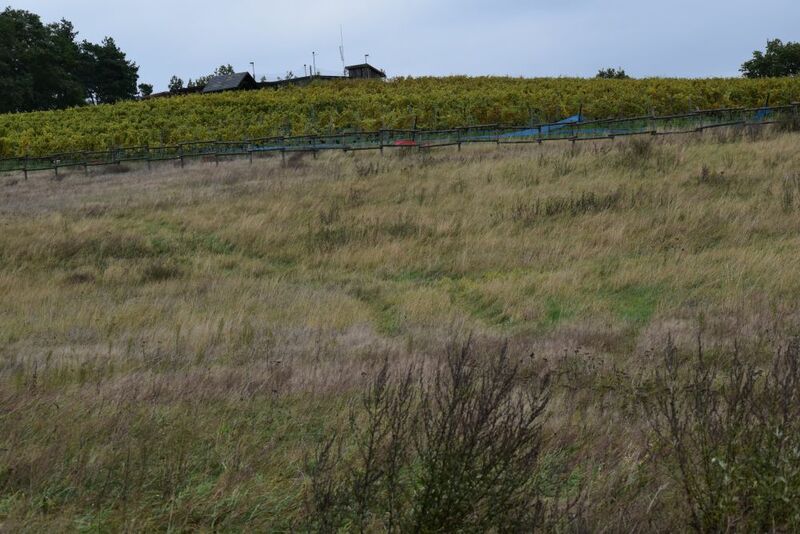 Hills in Brandenburg are not high, but there are slopes that allow to produce wine, especially now with global warming. It may not be a Bordeaux or a Burgundy wine, but I found well made wine from biological production. Oh yes, some people say that wines from Brandenburg are sour – but I found them to be good companions for tasty local meals. Let me tell you more about the monasteries and about the vineyards that we visited. Check out the book of Tom Wolf to find out more about 31 vineyards in Brandenburg. 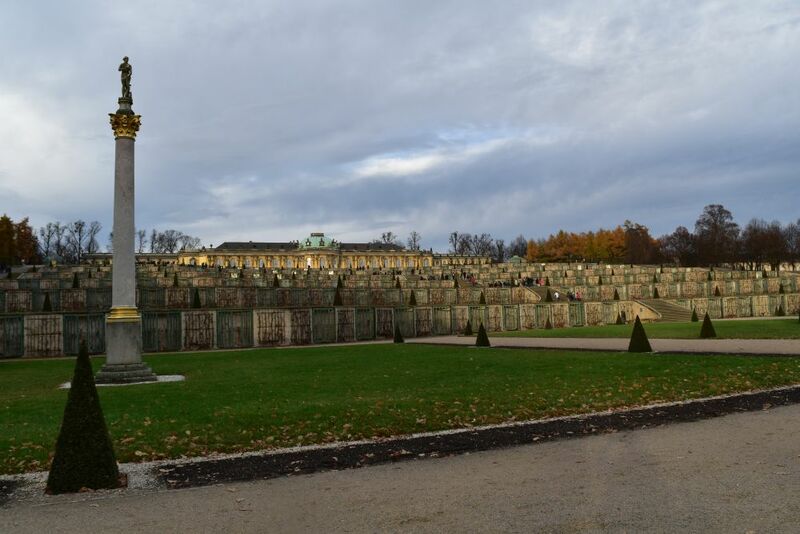 Frederick the Great or, as we call him, der Alte Fritz, may have told his subjects to cultivate potatoes instead of wine, but… he had his own vineyard in Sanssouci – a patchwork of small greenhouses with stone walls and glass windows climbing up the hill to his intimate palace “Sanssouci”. 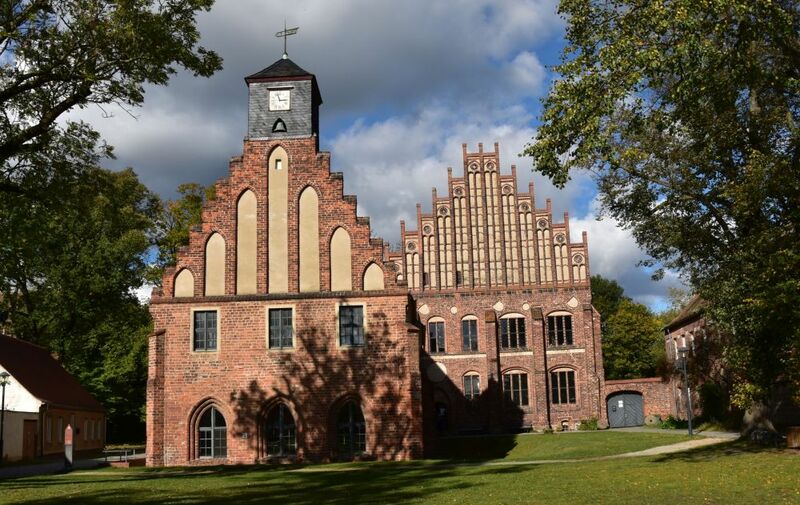 Prenzlau (north of Berlin) is located on the northern shore of the Uckermark lake. The Dominicans founded a monastery here. In the former refectory some frescos have been renovated. 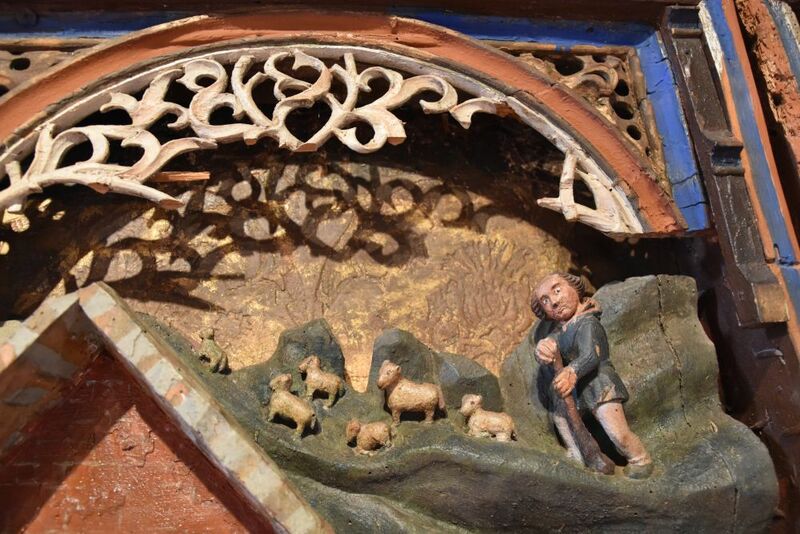 This beautifully carved altar shows the pastor with his sheep just arriving at the stable where Christ was born. The monks needed wine for their cult and selected the town wall to capture the heat and light of the sun reflecting in the Uckermark lake. This southward looking slope is very warm, indeed. I could feel that even on a chilly day. 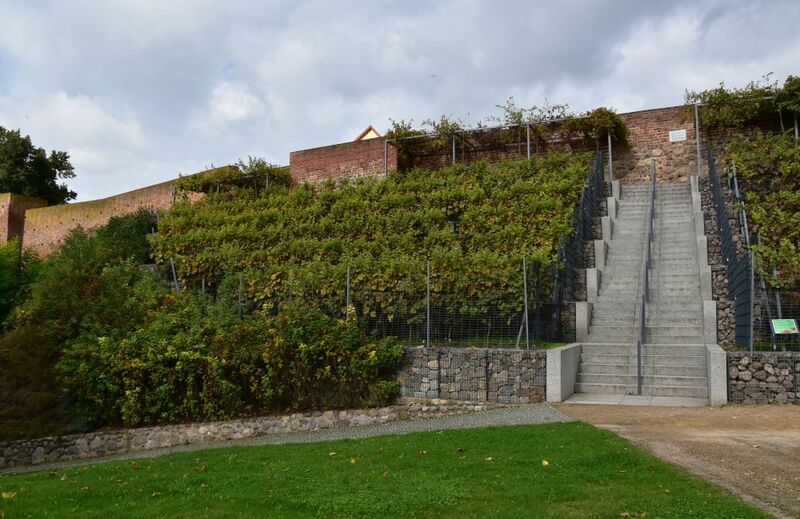 In 2013 the vineyard has been reinstalled for the LAGA which is a German garden exhibition (Landesgartenschau). The grapes planted are Regent (red) and Solaris (white). The wine is pressed in Pleisweiler in the Pfalz and can be bought in the tea- and wine house Gotzmann. (Tom Wolf, p. 207). Gotzmann was closed, when we were in Prenzlau, because it was a Sunday. We spent a few days in the Spreewald with its woods along ramifications of the Spree, where cucumbers become “Spreewaldgurken” in vinegar. 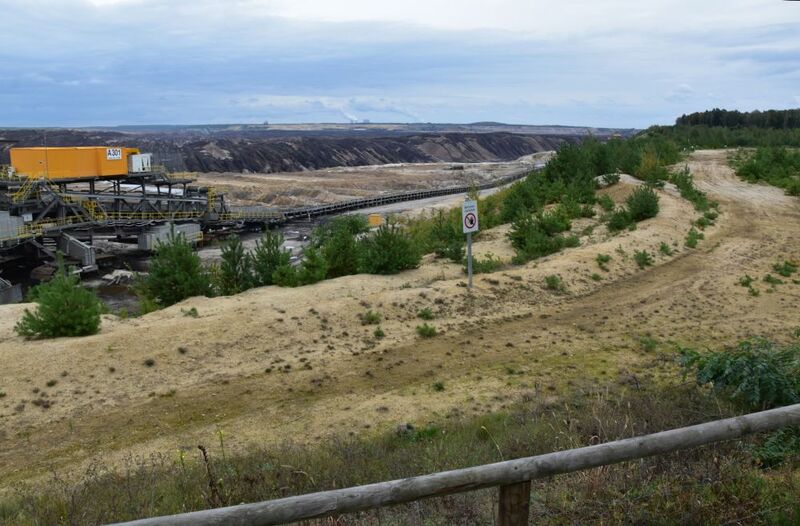 All of a sudden the forest opens and we see the open cast mine of Vattenfall near Welzow. A huge, huge desert. Villages had to be sacrificed, one of them being Wolkenberg with a former tradition of wine growing. Vattenfall started to plant their deserted hole and local specialists are cultivating the wine called “Wolkenberg” that can now be tasted in local restaurants (Tom Wolf, p. 145). Well, Vattenfall undertakes a small effort to repair what they have destroyed. I just stopped to breathe, when I saw this naked landscape. We selected the lookout point of Welzow, but from here, we could not see the vineyard. Instead we found Dr. Martin Krause’s vineyard in Drebkau/Klein Ossnig. 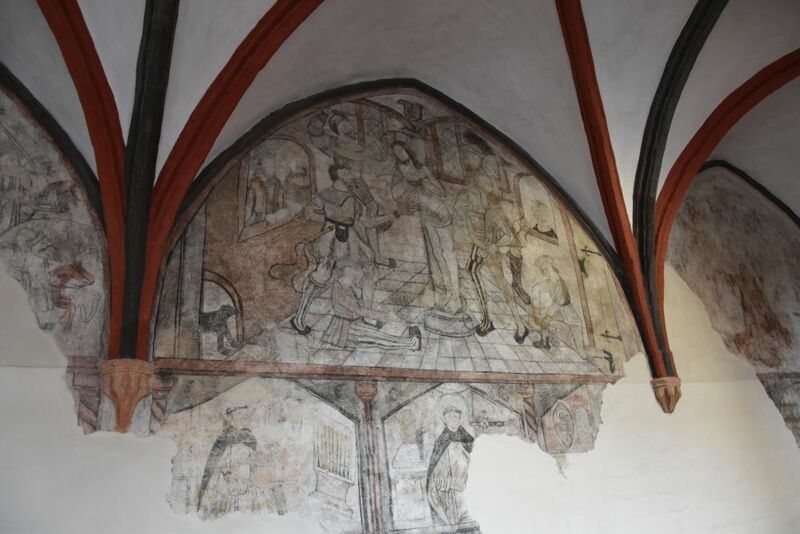 Dr. Martin Krause has done research and found that about 50 winegrowers were active around Cottbus in the 16th century There was a vineyard in Klein Ossnig that delivered wine to the monastery of Cottbus – look for the monks! (Tom Wolf, p. 163). In the southwest part of Brandenburg called “Fläming”, we visit the open air museum “Glashütte”. 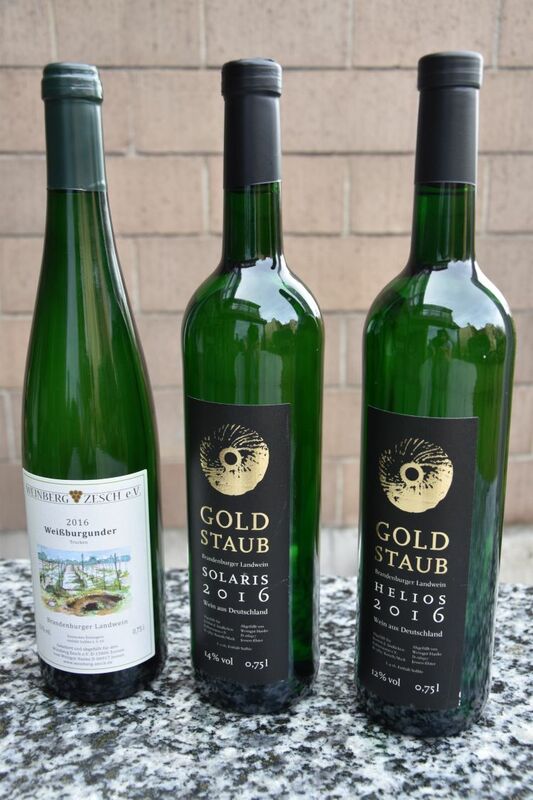 Beyond learning about how they made glass here, I buy three bottles of wine in the Weinsalon Glashütte: Brandenburger Landwein from Zesch (Pinot white) and two bottles of Goldstaub with white wine made from the grapes Solaris and Helios that are common in this area. By the way, the wine saloon also offers wines from Moldovo and organizes events. A very inviting place. Tom Wolf talks about the Weinberg Zesch that benefits from the lake of Zesch, not far from Baruth (p. 83). He also mentions the Mühlenberg in Baruth that produces the wine called “Goldstaub” – yes, there is a mill-wheel (Mühlrad) on the label (p. 89). I have never tasted Solaris and Helios before and I am curious. The monastery of Lehnin and the adjacent hospital are now run by deaconesses. By the way, this romanic monastery is called Le-H-nin (with an “h”). The monastery owned various vineyards in Werder which is a quiet town spreading out widely on the shores of the Havel near Potsdam. The Wachtelberg was one of the vineyards and today it is a vineyard again. We found it amidst the houses of Werder. There is a wine bar (Weintiene) on top of the hill that is open in the afternoon. Dr. Linicke started to grow wine in the late 80’s in the former GDR, but after the fall of the iron curtain, nobody was willing to buy wine from the “east”. In 1994 the wine production was restored, again involving Dr. Linicke (Tom Wolf, p. 33). 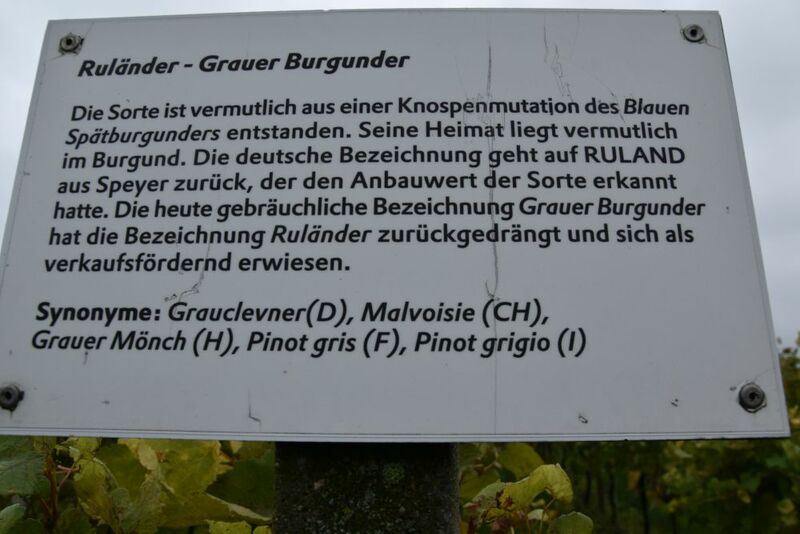 Now he has installed the “Erlebniswanderweg Wachtelberg”: Each line of grapes is described in detail, like this line of Ruländer or Pinot Gris. Lara Wolanski does horse dressage and her father, Klaus Wolanski, started in 2007 to grow wine in Töplitz (Tom Wolf, p. 19). When we arrive at the Klosterhof, we find a message at the door: “Call me, I am happy to come”. Very soon a roaring noise announces the arrival of Klaus Wolanski. He comes on his small tractor and welcomes us with his black-white dog. He tells us that his wine production is based on biological principles. 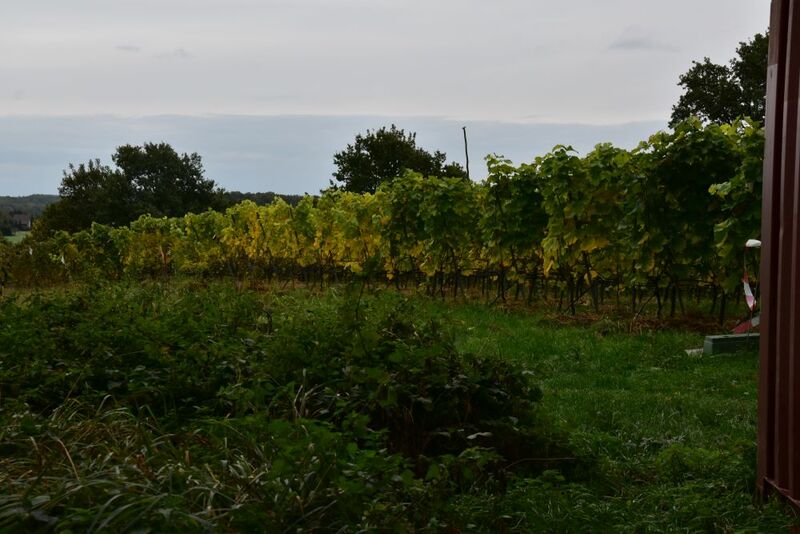 Here – so far north – the grapes are not delicate, they do not need those strong pesticides, he says. There is grass in the vineyards that the sheep “cut”. The sheep also eat the leaves such that the grapes get more sun. They do not like the grapes, as long as they are sour, but – they would love them, once they are sweet. Hence these “helpers” have to stay outside now, in autumn. We walk around in the area. There is a picnic place on top of the Töplitz hill. People used to flat land might be happy to recover from the steep ascent. And it must be a great place to celebrate. We buy some wines – Riesling, Pinot Gris (both white) and Regent (red) – one bottle of Regent has matured in the barrel. Annerös takes one bottle of Regent home. She drinks it with her husband, and they like it. Well made, they said. Soon after arriving at home, I shared the Grauburgunder or Pinot Gris with my neighbours. The wine was clean and freshly fruity – a real “Ruländer”. In the monastery of Zinna – also a Cistercian monastery founded in 1170 – they produce the “Zinnaer KlosterBruder” or “Zinna Monastery Brother”. Right in the building under the clock. It is a herb liquor that is supposed to be healthy (monks called their herb liquors “aqua vitae” (water of life) and used them as a medicine. The technique of distilling liquor has been known at least since the 12th century, perhaps even earlier. There is a legend related to the “KlosterBruder”: A cavalier from the area was in love with a lady that was too noble for him. As he could not marry her, he went to the monastery, where he produced holy paintings with the face of his beloved noble lady. The abbot recognized the face and made him destroy his paintings. The monk obeyed and started to collect herbs. He invented the herb liquor “KlosterBruder” named after him and discovered that this drink made him feel cheerful and happy. Herb liquors are not really my favourite drinks… To my opinion they taste like medicine. 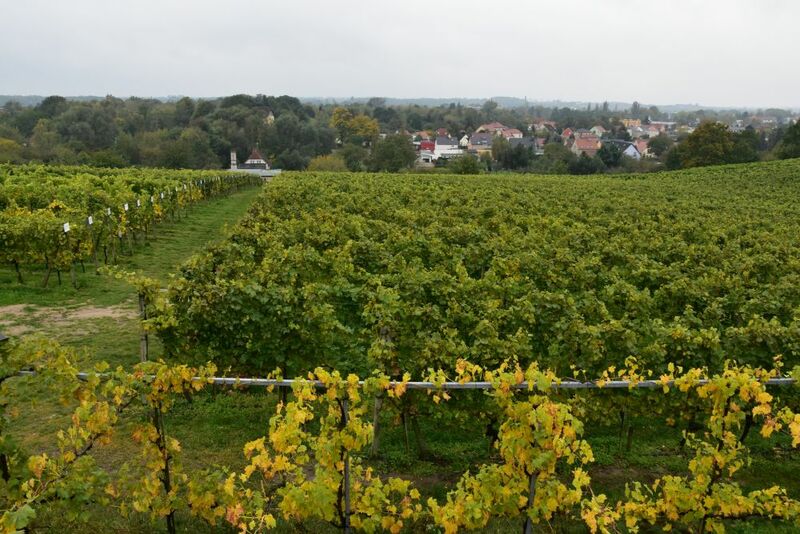 But I like wine – and the wine culture in Brandenburg was a surprise for me. 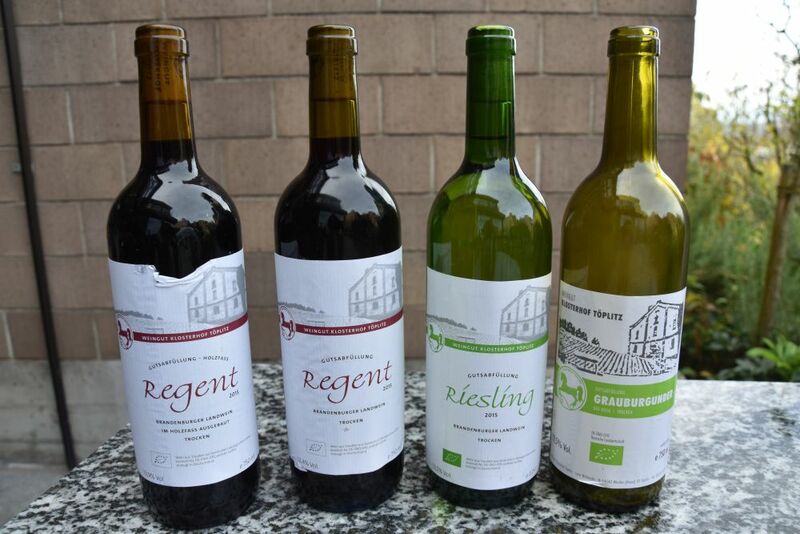 The wines make nice – though a bit unexpected – souvenirs from Brandenburg! And there are more vineyards to explore, when going back – at least 31 of them. 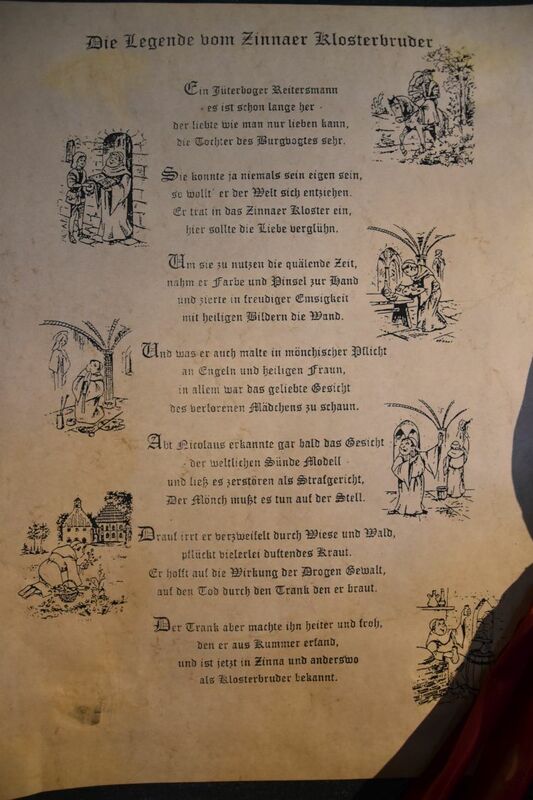 In addition, there is much more to see in Brandenburg – the early Slavic immigrants (Sorbs and Wends) and the ramifications of the rivers (Spreewald, Havelseen or Oderbruch). We found numerous castles (Wiesenburg, Eisenhardt, Lübbenau, the Fürst Pückler park with the duke’s castle or charming Sanssouci in Potsdam) and nice bigger and smaller cities (Bad Freienwalde, Jüterbog, Bad Belzig, Lübbenau or Brandenburg) with timbered houses and gothic churches and townhalls made out of brick (we call that German Backsteingotik – sometimes even Backsteinromanik). I will go there again. Perhaps for a bicycle tour.